Renal biopsy remains indispensable in the diagnosis of medical renal disease manifesting as proteinuria, hematuria, or renal failure. Most biopsies can be accomplished per-cutaneously with ultrasound guidance and a spring-loaded biopsy gun. Reported complications rates with this procedure including postoperative bleeding (the most common complication) are between 11% (23) and 34.1% (24). Manno et al. (24) reported a major complication rate of 1.2% in their series of 471 patients including 1 nephrectomy. Rates might be expected to be higher among high-risk patients. 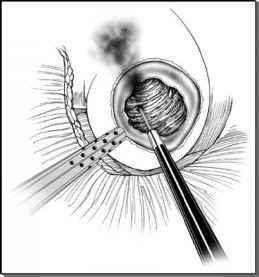 In such cases where percutaneous biopsy is contraindicated, alternative methods must be employed to obtain the biopsy. Several other methods have been reported. Percutaneous computed tomography-guided biopsy (25,26) is an alternative to ultrasound-guided percutaneous biopsy, which, similar to ultrasound guidance, does not involve general anesthesia, but is not appropriate for extremely obese patients who do not fit in the scanner. Another option is transjugular kidney biopsy (27,28). While this procedure provides diagnostic biopsies approximately 90% of the time, it involves capsular perforations between 13.5% (28) and 73.9% (27) of the time, increasing the risk of bleeding into the retroperi-toneum, or the collecting system. In the study by Fine et al. (28), 1 of 37 patients required transfusion, while in Thompson et al. 's report (27), 1 of 25 patients developed an arteri-ocalyceal fistula, and another patient developed a renal vein thrombosis (27). There is also a report of transureteral renal biopsy through an upper pole calyx accomplished with an 18-gauge needle sheathed in an 8 French catheter inserted through a 10 French transureteral catheter (29). Open biopsy and laparoscopic biopsy are the two methods that allow direct vision both during biopsy and during subsequent achievement of hemostasis, which is important in patients who may be at high risk of bleeding. Laparoscopy has the advantage of being less invasive and less morbid than open biopsy. Many patients who are candidates for laparoscopic renal biopsy have significant medical comorbidities. Shetye et al. (8) reported that 47 of 74 patients in their series had American Society of Anesthesiologists physical status scores of 3 or 4. Thus a disadvantage of laparoscopic renal biopsy compared to percutaneous biopsy is the need for general anesthesia. However, Micali et al. (30) reported the successful use of epidural anesthesia in a patient requiring laparoscopic renal biopsy with severe comorbidities that made him a poor candidate for general anesthesia. Therefore, general anesthesia may not be absolutely necessary for this procedure, particularly if it can be performed quickly thus minimizing the risk of hypercarbia. Renal biopsy remains essential in the diagnosis of medical renal pathology. In most cases, this can be accomplished with image-guided percutaneous biopsy. However, in the rare instance that direct-vision biopsy is required, laparoscopic renal biopsy is a safe and minimally invasive technique for obtaining renal tissue in high-risk patients. Careful patient selection and counseling, with meticulous intraoperative hemostasis, and careful resumption of anticoagulation medication after the procedure help ensure a safe outcome following renal biopsy in what can be a challenging group of patients.